What do the Vader experts think of this one? It was posted on another forum and is from the collection of Jason Joiner. My area of expertise is Stormtroopers so I am clueless about this. Hope this doesn't cause any problems for anyone, or threaten national security, I know how sharing pictures can be an 'end of the world is nigh' type of event! Would be better suited for the props section for discussion. It looks nice. Cleaned up, so hard to tell whether it's ESB or RotJ, but it has ESB details on it. Pic appears to be out of proportion. IMO this is what it should look like. 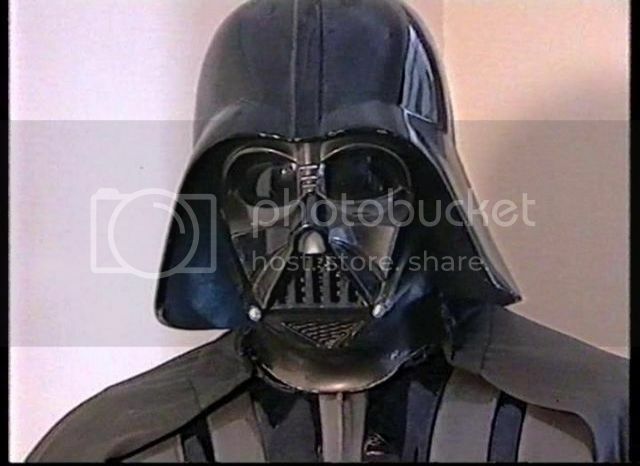 BTW: Moving this thread to the Vader Props section for better exposure. Thanks for putting in the right section. Here are the other pictures, they are screencaps from a video hence the distortion. They are purported to be original hence my interest and reason for posting here. Jason has consigned a number of original props to Profiles, such as the refurbished ANH/ESB Stormtrooper Helmet. Thomas, I would love to hear what you have to say. Did he screw up the two-tone paint-job? the top right cheek area with the nail mark shouldn't be grey. But definitely a nice looking piece. Good eye Carsten. Havent seen that on a Vader lid before. Might just be a badly done restoration job. Good eye Carsten! I wondered about the paint job too. We know he refurbished a Stormtrooper helmet very badly so perhaps he refurbished this helmet too. From what I can gather Jason was among the first to contact crew regarding props, before the flood of modern day original prop collectors, so he managed to snag lots of trooper helmets and other sought after props. Yeah... ...I wouldn't mind having it in my collection!